View of “Francesco Vezzoli: Museo Museion,” 2016. There are two related exhibitions that have taken over this institution: the first retrospective of Francesco Vezzoli’s sculptures, which are on view through May 16, and a show the artist has curated of historical works from the museum’s collection, which runs through November 6. Collectively titled “Museo Museion,” the double exhibition begins with a large wallpaper installation that blows up a painted Roman vista by Giovanni Paolo Pannini (Gallery of Views of Modern Rome, 1759). Sandwiched between two burgundy velvet curtains, the work seems to exist in a state of continual unveiling, and it has been revised in postproduction to allow figures such as Nicki Minaj to peek out, among many painted by the eighteenth-century artist. It is no accident that Vezzoli has chosen Pannini; also working in Rome, Vezzoli too has devoted himself to restoring, copying, researching, and evaluating works by past masters. Indeed, the very Italian and very international artist sometimes recalls Aby Warburg; Vezzoli always finds taxonomic reasons for combining his historical sources with modern and contemporary subjects. 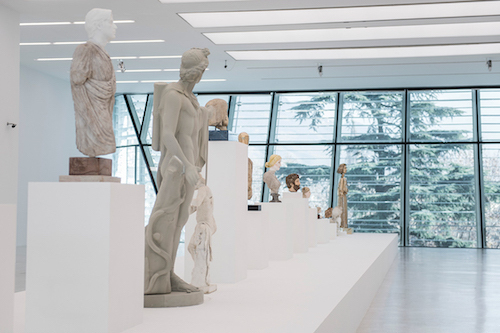 See his series of sculptures here, some twenty in all, where, for example, he associates Carla Accardi’s Labirinto (Labyrinth), 1957, and Titian’s Fête champêtre, 1510–11; as well as Sophia Loren as the “muse of antiquity” with Giorgio de Chirico. In all, this is a personal staging of part of the museum’s collection by an artist who is a living contradiction. But in a literary more than a visual sense, he seems to always express a reasonable foolishness.